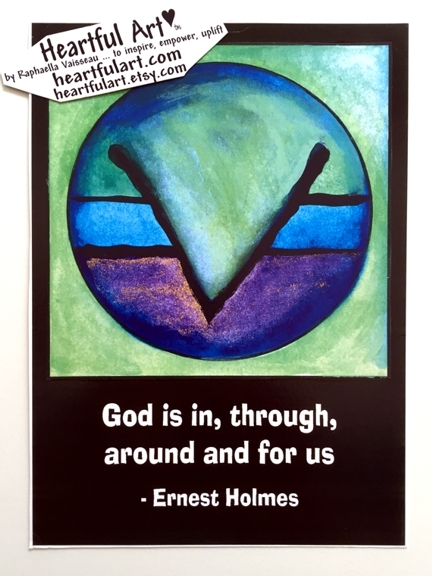 Poster or print of a law of attraction quotation by the founder of the New Thought Church of Religious Science, Ernest Holmes. "God is in, through, around, and for us" - Ernest Holmes. The artwork is Raphaella's rendition of the Science of Mind Teaching Symbol (created by Ernest Holmes). It depicts the threefold nature of God and Humankind. In the top section is Universal Spirit (which is called First Cause - the originating thought). In the center section is the Universal Subjective Mind (also called Law - which is the Creative Medium by means of which Spirit passes into form). In the lower section is the Physical Manifestation of Spirit (form, effects, conditions, etc.). Know you are adored by God, supported, protected, and you are never alone. Keep the faith. Allow the presence. Feel it. Accept it. Give thanks.